9:39pm Fully dialated and pushing. (on the monitor and we can see hair). 11:15pm Peter is finally born. 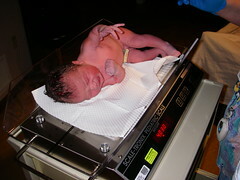 8 lbs 14oz.